holy wow, guys! 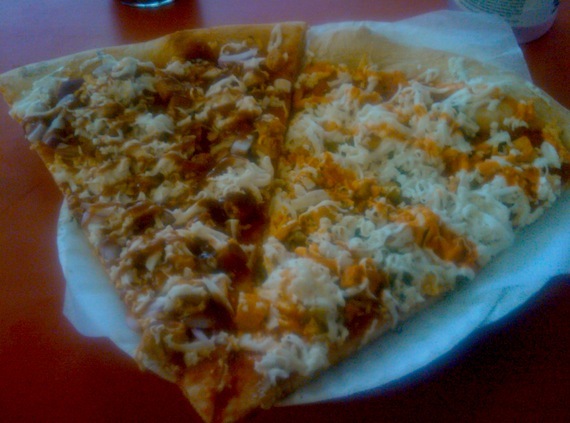 i think we all need to book a trip to brooklyn just to eat at vinnie’s pizza. 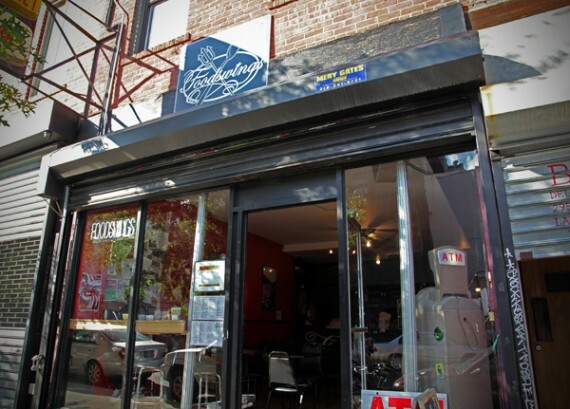 the brooklyn pizzeria has two locations and an ASTOUNDING SEPARATE VEGAN MENU with options like bbq beef pizza, both follow your heart and teese cheese, garlic knots, hot dogs, beef rolls, drumsticks, and custom desserts. i’m going crazy just thinking about it. after a long day of traveling and getting by on only snacks, papacitos in greenpoint, brooklyn was the very first stop we made from jfk airport. 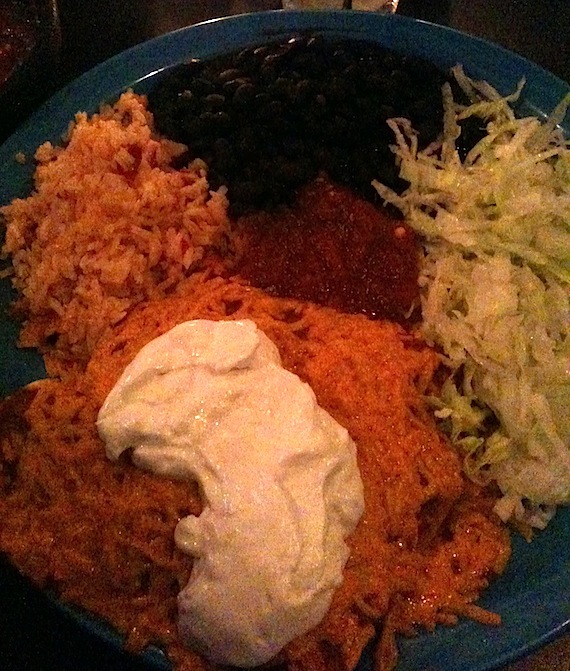 i was so starving and tired i only took this single barely lit photo of my enchilada plate. papcito’s is incredibly vegan friendly and everything is clearly marked on the menu. 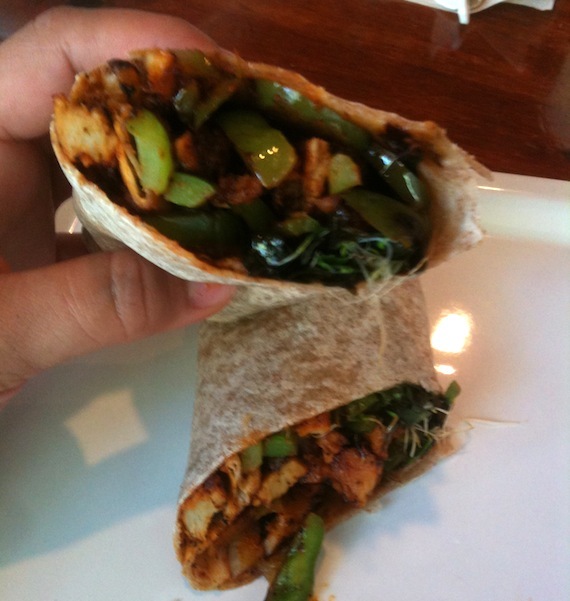 for their filling options on tacos, enchiladas, etc, they have four vegan options: seitan, tempeh, grilled veggies, and soyrizo. do you have a list of vegan food places you need to visit before you die? i’m not talking about an LA-based list, but a one that knows no boundaries. a “wish list” of all the insane animal-free food on this planet that NEEDS TO BE EATEN at some point, some point SOON. if you do, add foodswings in brooklyn to that list. i’d heard people rave about foodswings forever, i don’t know why it took me so long to get over there. it’s basically an all vegan fast food joint with a giant menu full of deep fried and hearty goodness. if anyone were to ever say they had a hard time going vegan because they missed “normal food,” this place would quickly change their mind. i had a super hard time deciding what to order. i went back and forth between the baked potato skins, the reuben, and fish n chips…but eventually decided on the gyro. i had a meat gyro once years ago when i was a kid, and i remember really liking it, so i wanted to see how this one measured up. naturally, it was amazing. 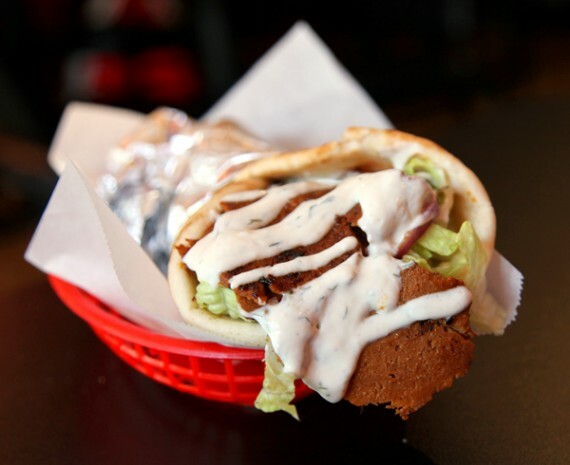 it came filled with foodswings’ homemade seitan, lettuce, onion, and tomato all covered in a vegan tzatziki sauce then wrapped up in warm flatbread. the seitan was spongy and slightly spicy, so wonderfully seasoned. the tzatziki was also delicious, super milky (you’d never know it was vegan), and filled with cucumber flavor. let’s just say i loved this sandwich. we also got the combo plate, which comes with 3 of any flavors of foodswings drumsticks, as well as a side. 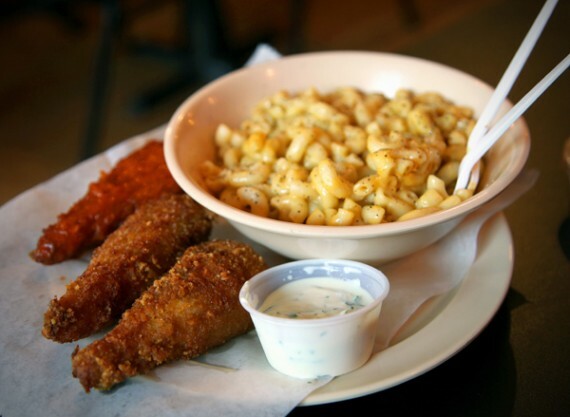 again the decision was tough, but we went with 2 southern fried and 1 buffalo drumstick, with a serving of mac and cheese. i’m pretty sure the drumsticks were just pre-packaged mock meats, but foodswings did wonders to them in the cooking process. the buffalo one was breaded, fried, and smothered in spicy sauce and served with a cool and creamy bleu cheese dip. the southern ones were battered and fried—super bready and crispy on the outside. there are two types of mac and cheese to choose from at foodswings, original (which is made with nutritional yeast), and creamy (which is daiya-based). we went with the creamy one, and it was fantastic. it reminded me a bit of the amy’s frozen mac and cheese, but even better. 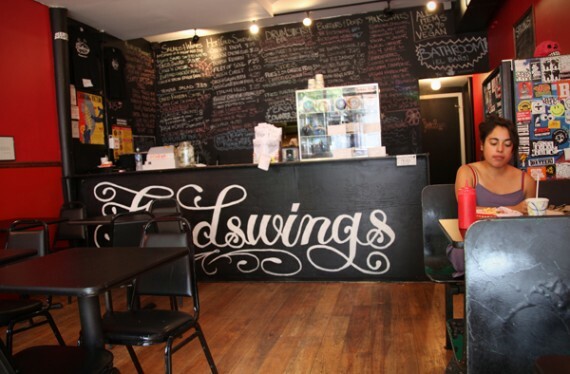 inside, foodswings is like a cleaner and hipper version of a normal fast food place. there’s a huge chalk board menu, and you order at the counter then wait for them to bring the food for your table. it was a super quick and comfortable dining experience. oh, and i think it’s also byob! overall, we loved foodswings and cannot wait to return. this was definitely the best vegan fast food fix i’ve ever gotten; with a blend of pre-packaged ingredients and their own homemade recipes, foodswings makes magic in their kitchen. you gotta check this place out!